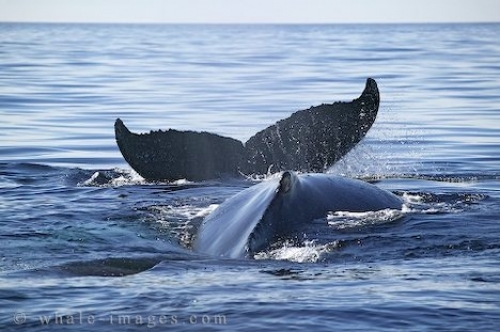 A quirky picture of two humpback whales, in the waters of the Atlantic Ocean. These endangered animals are given the name humpback to describe the motion the creature makes as it arches its back out of the water in preparation for a dive. These two humpbacks were just milling around with each other when suddenly one just dived. The humpback was placed on the endangered animals list due to drastically reduced numbers.